The school is a project of socially conscious women for distressed children and is unique in the area creating facilities for distressed children to receive the basic education. 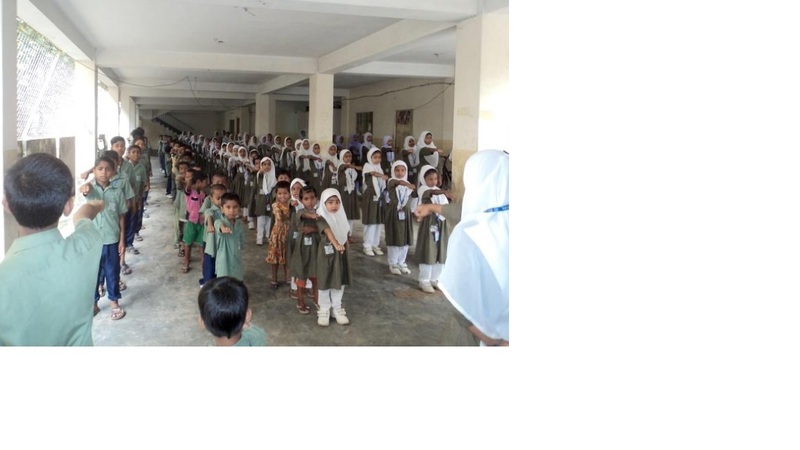 The school provides all educational materials and school uniform free of cost to the students. To assure a participatory approach a small tuition fee is charged to the students who can afford, others receive free education. Besides BACHAO, a Bangladeshi American Charitable Organization, Ankur International also came forward to help and assist Al-Ehsan Dustha Shishu O Mohila Shiksha Kendra for about 2 years now. The school starts on working days at 8-00 hours in the morning with assembly and PT and remain engaged in classroom teaching. Three-term examinations are held every year and the total of marks obtained, if exceeds the minimum required, qualifies a student for the next higher class. Students of class V and class VIII sit for public examination of PSC & JSC. Besides, Al-Ehsan also participates in scholarship examination of Savar Upazila Kinder Garten Association. Both male and female students are enrolled and new students are welcome each year. After graduation, they are provided counseling and a certificate as well. School follows the standard curriculum and tries to maintain a competitive and friendly environment to keep the students motivated. Higher emphasis is given on science, math, and literature. However, other subjects like history and geography are also taught in the school. The purpose of this school is to give all students irrespective of race and economical status a fundamental education so that they can carry it over to their next level. School teachers also go door to door to encourage parents to let their students study instead of helping them to raise family income. By providing stipends to the studious and brilliant students, the school encourages higher participation. The school is in dire need for more fund. Currently, it is funded only by Bachao and Ankur to a small degree. Other funds come locally which isn’t enough at all. Having higher funding, it can expand to even higher classes up to High School level providing even further education support. For more information please contact Shahriar Akbar ([email protected]).